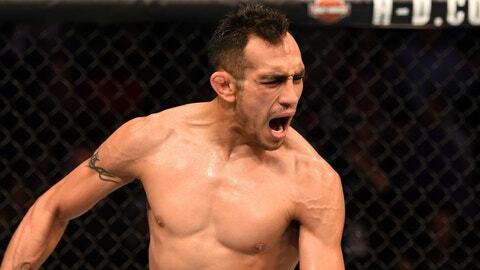 It's going to be hard to deny Tony Ferguson a title shot after his latest performance on Saturday night in Mexico City. To earn his 9th straight victory — a new record for the longest winning streak in the history of the UFC lightweight division — Ferguson had to beat former champion Rafael dos Anjos in a grueling, five round war. Ferguson made a lot of changes for his training camp to prepare for this ever important battle and that included moving his entire team to Big Bear, California where he opened up his own facility to get ready for the biggest fight of his life. The hard work certainly paid off as Ferguson was an offensive machine over 25 minutes while turning dos Anjos' face into hamburger with his constant barrage of punches, elbows and kicks throughout the five round affair. The fight also served as a chance at redemption for dos Anjos after he lost his lightweight title to Eddie Alvarez back in July and it appeared in the early going that he had returned to form after stinging Ferguson with a series of hard straight lefts that caught the No. 3 ranked contender repeatedly. Dos Anjos also fired off a series of hard leg kicks that likely earned him the nod in the opening round as he set the tone and kept Ferguson on his heels throughout. The momentum quickly shifted in Ferguson's favor in round two as he not only started to find his rhythm, but he began to stalk dos Anjos around the cage with a volume of strikes the former champion had likely never seen before. Ferguson's relentless pace not only put dos Anjos on his heels, but he started to land more and more punches that targeted the right eye, opening up a cut that began seeping blood. Add to that, Ferguson popped dos Anjos in the nose and that also started dripping blood like a leaky faucet, which could have easily hindered the Brazilian's breathing as the fight moved into the championship rounds. Despite the damage being done to his face, dos Anjos wasn't going to go away easy and he fired back with some hard counter shots that snapped Ferguson's head back several times throughout the course of the fight. The miraculous part was Ferguson just eating the shots and continuing to plod forward as if he never got punched in the first place. 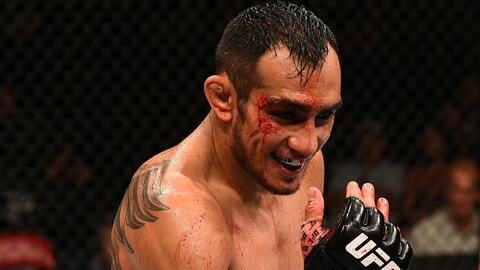 As the fifth round got started, Ferguson still looked just as fresh as when he walked into the Octagon and while dos Anjos showed no ill effects of the high altitude in Mexico City, his face was a bloody mess. The ill effects of the constant strikes had dos Anjos wiping his face constantly as Ferguson kept on the attack, feeding the former lightweight king a steady diet of punches throughout the final five minutes. In total, Ferguson landed an incredible 199 significant strikes with 49.6-percent accuracy over five rounds. Dos Anjos didn't do too bad in return as he landed 121 strikes of his own, but it was clear he took the brunt of the punishment from his opponent when the fight was over. The scores all returned 48-47 in favor of Ferguson, who has now put together nine straight wins capped off by his victory over dos Anjos on Saturday night. Ferguson didn't have much of anything to say after celebrating the win, simply shouting out the Mexico City crowd before leaving the interview area to enjoy the moment with his team. If anything, Ferguson's performance speaks volumes about his standing in the division as he now holds a win over a former champion while putting together a resume that's virtually unmatched at 155 pounds. Ferguson has made a strong case why he should be the next person to challenge the winner of the UFC 205 main event between Eddie Alvarez and Conor McGregor, but there's no telling how things will ultimately play out. Undefeated Russian and No. 1 ranked contender Khabib Nurmagomedov will try to make his own case for a title shot when he faces Michael Johnson next weekend in New York. One thing is clear, the lightweight division is absolutely packed with top contenders and after his latest win, Ferguson may have put himself head and shoulders above the rest.